How's the cost of ownership? I\'m looking at a pre-own 2013 Lexus 350, 6 cylinder, for sale and it is in excellent condition with about 32k miles on it. My question to current owners is, what is the annual cost of ownership for this vehicle and what kind of gas mileage have you experienced for city driving? I love the body style on this model year and would regret passing it up, but only if it\'s not going to be a money pit. According to Edmunds gas mileage survey, this 2013 model year averages among its viewers 21 mpg on premium fuel. Squeaks and rattles and occsional power equipment issues are the only concerns reliablity wise (Lexus is one of the top brands in reliablity). It won't be a money pit as far as repairs. As far as gas consumption, it is not the best. I chose to buy recently a Buick Envision (2018) at a $13,000 discount since the 2019 launched with some substantial changes on May 1, 2018. I average in comparison 24 mpg and it is considered a slightly below average gas mileage average for this day and age (the new 2019 Envision corrects this by moving from a six speed to a nine speed automatic which will probably raise the average gas mileage 1-2 mpg). It is a good deal and I would take it myself if that was available to me (and I just bought a new car... which I do like a lot with all its luxury features I never had before). Fuelly has the RX mostly in the 19's. Don't worry about cost of ownership with a Lexus because they are the most reliable brand on the road and have been for a very long time. Repair costs are not as high as the Germans. RX mileage is a steady 19-20 MPG combined. Not great, but the engine is tried and true. The engine is old technology, smooth, quiet, and reliable. If you want higher MPG, they have the RX450h, which is sort of a waste of money considering the added purchase price. It definitely won't be a money pit. It has always been reliable and is the best selling luxury vehicle in America. 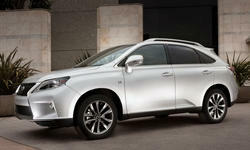 Lexus is also the most expensive of similar vehicles mentioned above. So there is a cost to that reliabilty. Just avoid 2016-2017 models as they have 28-31 repairs per 100 and is on the high side for a $40K suv.